Harlan Malter and Phil Hager at the 2019 OBS March 2-Year-Olds In Training Sale. The dream for any young sports fan is to be part of a team they admire. Countless NBA championships have been won off a buzzer-beater into a wastebasket, and just as many Super Bowls have been secured in the backyard as one last pass flies through the air before dinner. For a twenty-something Harlan Malter, that dream was being on the same team as Hall of Fame Thoroughbred racehorse Cigar, who was trained by Bill Mott. When Cigar made his two appearances at Boston-area Suffolk Downs for the Massachusetts Handicap, Malter made the trip north from law school in New York to watch the horse extend his legendary winning streak, first to eight in 1995, then to 15 a year later. Malter admired Mott's barnstorming gameplan for Cigar, who raced at nine different tracks during his then-record 16-race winning streak, but horse ownership seemed like a far-off idea at the time. More than two decades later, Malter had a barnstormer of his own, turf sprinter Bucchero, who had taken him across the Atlantic Ocean to run in the prestigious Royal Ascot meet last year under the colors of Ironhorse Racing Stable, of which he is the managing partner. The stall next to Bucchero was occupied by multi-surface star Yoshida, a Mott trainee. Malter had drummed up a friendship with Mott's son Riley during their time in Ascot, and on race day, he ran into Cigar's conditioner himself. Malter is nothing if not a tenacious individual when it comes to his horse racing interests, and as such, he kept in touch with the Mott team after Royal Ascot. When Bucchero retired to Florida to begin his stallion career, he made a point to visit the Mott barn at Payson Park to further the discussion about one day having an Ironhorse runner join the trainer's ranks. Before long, the owner and training family decided to make it happen. They just needed a horse, and someone who knew what they were doing to choose that horse. Riley Mott was quick to recommend Kentucky-based bloodstock agent Phil Hager, a childhood friend and former barn foreman for the Mott operation. Hager's quieter demeanor serves as somewhat sharp contrast to Malter, who has found himself to be very comfortable in the spotlight Bucchero has provided him over the past few years. 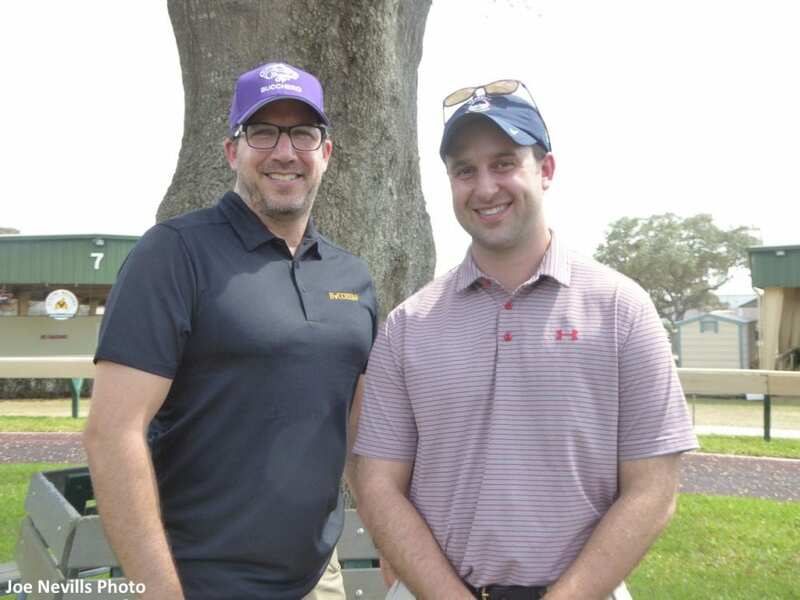 Malter and Hager set a course for the Ocala Breeders' Sales Co. 2-Year-Olds In Training Sale to land a runner for Mott to train for the Ironhorse partnership. The owner had success buying the Indiana-bred Bucchero for a relatively low price out of the OBS June sale, but he didn't plan to make drastic changes to his shopping protocol now that he had a graded stakes winner on his resume. After all, he had partners to look after, and the money to buy the horse was raised by that group before the sale. Fortunately, Malter's day job gave him plenty of experience looking over the investments of others. They had their horse when Ironhorse Racing, in partnership with BlackRidge Stables and Paradise Farms Corp., landed a Mr Speaker filly out of the Arch mare Goalkeeper for $125,000. The filly, consigned by de Meric Sales, as agent, breezed a quarter-mile in :21 seconds flat during the pre-sale under-tack show. With ample experience working for the Mott barn and shortlisting for the trainer at sales, Hager knew what he'd be looking for in a racing prospect. “Her gallop-out was one of the fastest in the sale, yet she has such a nice, easy way of going,” he said. “Physically and mentally, she is a horse that I knew the Motts would like. She is very leggy with good angles, a nice, clean neck, and a strong behind. She had a beautiful head and eye, and is very classy and sweet to be around. During Bucchero's on-track career, Malter and Ironhorse Racing became practically synonymous with Tim Glyshaw, the trainer that shared Bucchero's Indiana-born heritage and often served as the straight man to the more outspoken Malter. As he prepared to put a horse in training with Mott, Malter affirmed that this was anything but a split with the trainer that got him to the national stage. In fact, he'll be entering the second half of the juvenile auction calendar in search of another Ironhorse runner to add to the Glyshaw barn, with Hager's assistance. “Tim and I might as well be brothers at this point, and I think Tim also understands horse racing in general,” Malter said. “As ownership groups grow, they're going to have different trainers in different places. Tim has three horses for Ironhorse right now, and a fourth is on its way. My guess is he'll get every Bucchero baby we make, and he'll get a nice pipeline. More times than not, the kid that brings the baseball glove to the stadium doesn't get to one day suit up for the club, but from watching Cigar on the rail at Suffolk Downs, Malter now has his own team in place, complete with players, scouts, and coaches – one of which he's had his eye on for more than two decades. As Ironhorse Racing and its membership base expands, the opportunities for others to one day perhaps achieve a similar daydream grow with it. This entry was posted in Bloodstock and tagged bill mott, cigar, Harlan Malter, horse auction, Horse Racing, ironhorse racing stable, Mr Speaker, OBS March 2-year-olds in training sale, Phil Hager, riley mott, Thoroughbred partnerships, Tim Glyshaw by Joe Nevills. Bookmark the permalink.